Tosca is the masterpiece opera written by Puccini. It was first performed in Rome in 1900. It is one of the handful of operas that not only remain a favourite of opera lovers, but symbolises 'opera'. It is a dramatic melodrama set in 1800, with the lot. Passion, love jealousy, lust, murder, torture and betrayal. The arias are well known and authentic staging is expected by the faithful audience. Puccini gave explicit instructions as to the settings. However, it would seem the audiences have to get used to bland costumes and scenery. But when the singers deliver it seems all is forgiven. This production was first introduced in 2009 by Luc Bondy and the boos drowned out the bravos at the end of the performance. In 1964 Zeffirelli staged Tosca in London starring Callas and Gobbi with correct settings and costumes a la Puccini, and nothing else was acceptable. It remained 'the' perfect version and was staged for the next 20 years. The Met held its nerve and today it's the Bondy production that remains. It is scheduled again for the 2015-16 season and only cheers were heard at the 2013 season. 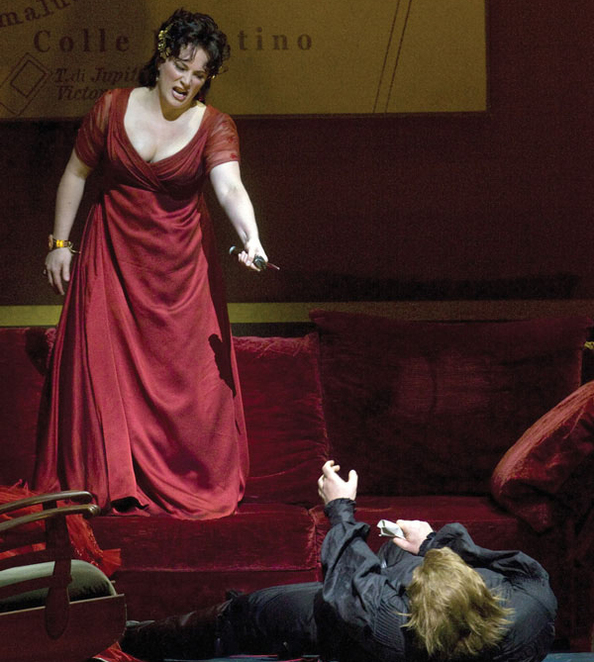 There is no such thing as an uncomplicated opera and Tosca is no exception. Here is a quick synopsis leaving lots out. Act 1- Love, jealousy and lust. The church of Saint Andrea della Valle, Cavaradossi [Roberto Alagna] is painting a portrait of Mary Magdelane, perhaps not in a church as she has a bare breast. Tosca [Patricia Racette] enters. The two lovers profess their love and Cavaradossi leaves. Enter the villain, Scarpia [George Gagnidza] who lusts after Tosca who manages to play on her jealous nature. Act 11. Torture, lust and murder. Scarpia's study in the Palazzo Farnese, [here we have to be content with the landing of a staircase a la Ikea]. Scarpia tortures Cavaradossi for information until Tosca can't bear it anymore and promises to let Scarpia 'have his way' with her to save her lover. She sings the universally loved 'Vissi d'arte [I live for art and love], and just as Scarpia lunges towards her, she stabs him with a knife screaming 'this is the kiss of Tosca'. Act 111. Betrayal, execution and suicide. Castle San Angelo. Scarpia had promised to arrange a 'fake' execution of Cavaradossi and gave them a pass to leave Rome. Not so, he is shot and Tosca jumps to her death. Racette is a fine singer and actress. 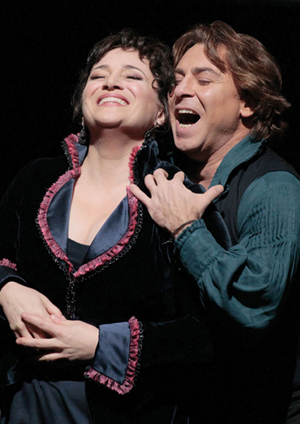 In the duets with Alagna her powerful voice and singing technique drowns out her partner, but on the whole, he holds his own. Gagnidze, although a fine baritone doesn't represent a powerful secret policeman, seducer of women and governor of Rome. 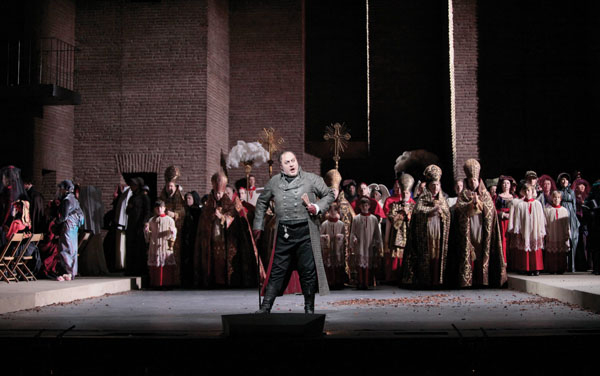 This repeat of the 2013 film in HD from the Met in New York is part of the Met Opera 2016 Encore Season.